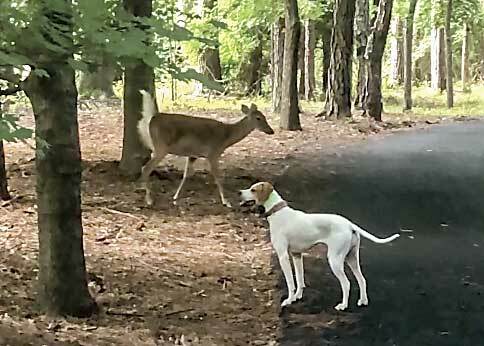 Above, Carolyn Taylor’s dog and a bold doe give a narrow berth to each other along a Peachtree City golf cart path. Photo/Screen grabs of video by Carolyn Taylor. You sometimes see deer in lush Peachtree City neighborhoods. But deer who attack pets in fenced yards? Deer who chase cart path walkers? That seems new. Take the case of Karri Robinson and her family, who three weeks ago moved into their home in the area of South Peachtree Parkway and Log House Road. Karri said they first saw deer in the area and thought they were cute. That view changed on July 1. Karri was sitting on the back deck when her chihuahua went into the back yard. The yard is not fenced and the lawn is 20-30 feet from the wooded area behind the house. Karri said a doe ran into the yard and began attacking the small dog, trampling it over and over with its front hooves. The chihuahua survived the attack and Karri incurred $1,200 in vet bills as a result. Karri’s other dog, a dachshund/cocker mix that weighs 20-25 pounds was attacked in the yard on July 5 and trampled in the same manner, though it did not sustain injuries as severe as those in the first attack. Karri said the doe did not run when the woman ran into the yard to break up the attack. The doe left the area only when Karri was a few feet from it. The deer was the same individual in both cases, Karri said. And yet there is more to what has been happening at her home. The doe is exhibiting behavior that is unsettling given that it has, on two occasions, been standing at the front door when a family member opens it to leave the house. Doe and man in a close encounter on the cart path. The doe subsequently followed the woman toward her home. Photo/Screen grabs of video by Carolyn Taylor. And then there’s Hunter Wood, who lives in the area of McIntosh Trail near Robinson Road, and whose beagle was recently killed by a deer in his fenced backyard. Hunter’s beagle was attacked and killed in late June after exiting the house through the dog-door to go into the fenced back yard. Though Hunter was not home at the time, the circumstances of what happened made sense to him. Hunter said a doe frequently jumps his 4-foot fence and feeds in the back yard. Two fawns, which cannot jump the fence, stay outside the yard area. It was evident, from the blood found in the yard and on the patio and the condition of the backyard, that the deer attacked the dog. The dog made it back into the house and died there, Hunter said. Reflecting back on his years of living in the area, Hunter said such attacks are not especially unusual, citing another attack on the beagle a dozen years ago. Hunter noted that a fawn will often stay behind while the doe feeds in a given area. And he explained that deer will go after coyotes and dogs that run loose, the type of animals that prey on fawns, and noting that, in his experience, larger dogs are not as prone to be attacked by deer. Hunter said there are a number of deer that customarily inhabit his immediate area, and sleep in area yards. The presence of that number of deer in the immediate area could be due to a neighbor that provides quantities of corn for the deer to eat, Hunter said. Lynsey Benton lives in the area of McIntosh Trail and Robinson Road. Lynsey said she and her dog have been the subject of three incidents where an adult deer approached and followed them. Two of those occurred during the summer season last year, while the third occurred recently. “Every time my dog was with me, every time it has been a doe and every time is was on the same area of the cart path,” Lynsey said, curious if the time of year had to do with fawns being in the vicinity and wondering if the mother is being protective of the young offspring. One on occasion last year, Lynsey said the doe began trotting in her direction. Lynsey said she ran back to her house, where the doe pursued her into the yard. The doe stopped once Lynsey and her dog ran inside the pool fence. “This year I avoided that stretch from Sandown Drive to Sawmill Trace,” Lynsey said, noting that she was on the cart path when the deer appeared recently. This time, Lynsey returned to her home about 50 yards away. “I think it was after the dog each time,” Lynsey theorized, anticipating that perhaps a dog represents more of a threat to a fawn that does a person. Several of the incidents occurred in neighborhoods in the area of McIntosh Trail and Robinson Road, essentially less than a mile apart. Other incidents occurred south of Crosstown Drive near South Peachtree Parkway and Log House Road. Yet another series of incidents occurred in recent weeks in the area of the Flat Creek Golf Club and McIntosh High School. 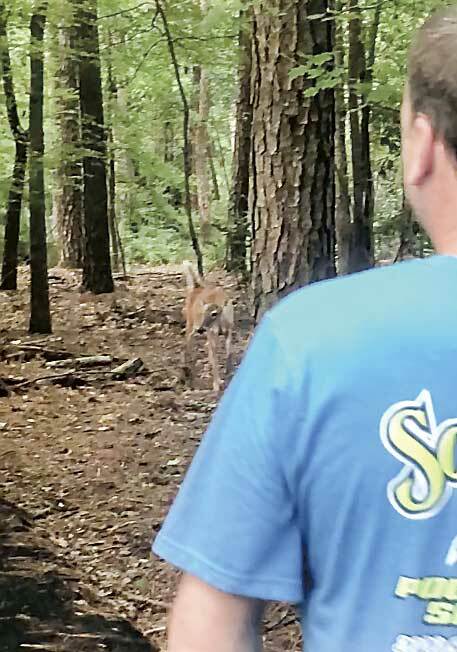 Each of the people interviewed, with many of them being longtime Peachtree City residents, were aware that a doe will become much more protective during the time of the year after fawns have been born. All are aware of the growing deer population in Peachtree City. Yet all questioned why, in the past few years and especially this year, so many are seeing deer behave in ways not seen before. Those interviewed have relaxed in their yards, walked the cart paths and neighborhoods for years, even decades, and have not witnessed the troubling encounters seen recently. While there are a number of possible explanations, Ga. Dept. of Natural Resources (DNR) Wildlife Biologist Theron Menken offered several suggestions on the issue and recommended those seeing unusual deer behavior contact his office. Doe unafraid of two people and their dog. Photo/Screen grab of video by Carolyn Taylor. The presence of deer in communities across Fayette County and across much of America has become a common sight in recent decades. 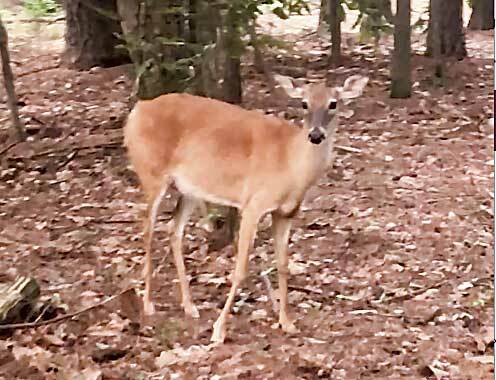 In Peachtree City, several longtime residents have experienced unusual deer behavior in the past year or two, and especially this year, that is significantly different than anything they have witnessed before. Opposed to being sensational or alarmist, these residents report having been followed or chased by deer and some have had deer attack their dogs while on cart paths and in their yards. It is likely that every resident of Peachtree City has seen countless deer in their yard or neighborhood or when travelling the cart path system. Deer have become ubiquitous and are simply part of the community. Yet what a number of residents have witnessed recently is a behavior in some deer that is unusual and unsettling, even frightening. Carolyn Taylor is another who was unnerved by her recent encounter with a deer unafraid of her dog. Raised in Peachtree City and recently back for a visit in the McIntosh/Robinson area, Taylor on July 3 was with her boyfriend and two dogs when a deer approached and began sniffing the dogs. Taylor noted that there were no fawns in the area. The video Taylor shot, which includes a cleared woodland area with no undergrowth present, shows one of her dogs standing silent while the deer canvasses the immediate area. Taylor said the deer, at one point, began charging at them and Taylor began to run. Taylor said her boyfriend distracted the deer so the dogs could get by, although the deer followed Taylor and the dogs to her mother’s house where it lingered for a while, she said, adding that the tip of the deer’s hoof came down on one of her Basset Hound’s hind legs. It was on July 5 that Taylor again saw a deer staring-down from behind the fence. In each of the cases, Taylor said she did not see fawns in the area. Carolyn had yet another encounter with a deer at approximately 8 a.m. on July 7, one that leaves more questions than answers. Carolyn let her two dogs out into the front yard and stood at the door. She soon saw what appeared to be the same deer as before enter the cul-de-sac from a neighbor’s yard, walking in her direction. It appeared that the deer saw the dogs and began walking toward them, Carolyn said, adding that she called the dogs and then put them in the house. The deer then came into the yard, up to the house and got close to a window, as if looking for the dogs. Carolyn said the deer stayed for approximately five minutes then left. She noted that there was no fawn in the area of the yards in the cul-de-sac. Another immediate area resident, Gail Dowis, had two recent encounters with a deer that also followed her and her dog. The first came during late June while on the cart path. Dowis saw a deer standing and two smaller deer, possibly fawns, laying near a fence. She and her dogs continued walking and the deer began to follow. Dowis kept walking faster and the deer continued following until Dowis tried to wave it off. The deer continued to follow until Dowis and her dogs entered a cul-de-sac. Two days later, Dowis encountered several deer on both sides of the cart path. She kept walking and, when returning to the area a short time later, one of the deer began to run slowly toward Dowis and her dogs until Dowis got in the golf cart she left by the side of the path and drove home. The deer had come within approximately 10 feet of Dowis and her dogs by the time she drove off. For Dowis and others, this behavior from deer is something not experienced in past years. Matthew Pendergrass, a 28-year Peachtree City resident, lives in the vicinity of the Flat Creek Golf Club and McIntosh High School. Pendergrass often runs his dog in the early morning and late afternoon hours. Pendergrass said deer have become more aggressive in the past two or three years, and especially this year. Pendergrass said there have been three occasions where he was running his dog from his golf cart and a deer has run along side trying to kick the dog. The same thing happened on his street, Pendergrass added. In all, Pendergrass has had five or more encounters with deer in a period of six weeks compared to one occasion last year. One of the occasions this year occurred in the cul-de-sac near his home. He said a buck was on the ground just off the pavement, snorting and pawing the ground and acting territorial. Pendergrass, like others, noted that in times past, the presence of a deer in the immediate area will result in his dog barking or giving chase and the deer exiting the area. In recent times, something has changed. It is something for which residents are unable to understand. “Over the past two or three years they have become more aggressive,” said Pendergrass, noting that he has lived in Peachtree City most of his life and is searching for an explanation. DNR biologist Theron Menken provided significant information pertaining to why such an escalation of unusual behavior might be seen, though also acknowledging that a full explanation may not yet be available. 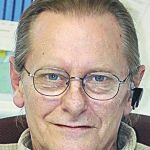 Menken on July 6 said aggressiveness in deer, as area residents are aware, is usually associated with a doe after the birth of a fawn between March and July and with a buck during the mating season in the fall. Menken noted that dogs will often incite a confrontation with deer that can trigger a response. Since most people know this and since in the cases cited above the dogs did not manifest any overt behavior toward the deer, Menken was asked what variables with the deer population might have changed to elicit the current unusual behavior. Menken said that, given the close geographical proximity of some of the behavior reported, it could be that either one, or perhaps a small number of deer, has been fed by residents who do not understand that doing so can alter the behavior of a wild animal, causing a break from the deer’s normal life pattern and emboldening it to manifest new behaviors. “This may be part of what we’re seeing,” he said. And there might be other variables. Menken said the increasing deer population can result in increased numbers of deer with which to have issues. There is the potential that a given recent interaction between a human and a deer resulted in the deer reacting in a novel way. Still another reason might be illness. If a deer had rabies, the infection would lead to death within 10 days, Menken said. With other neurological diseases, the illness would run its course, and the deer will meet its death, likely within a couple of months, Menken said. Menken’s advice was that residents witnessing unusual deer behavior contact him at the DNR Region 4 office at 478-825-6354 during business hours and after hours at 800-241-4113. Another resource for residents experiencing unusual deer behavior is the Fayette County Marshal’s Office. Marshal Harold Myers said those witnessing unusual behavior should contact his office at 770-320-6070. Peachtree City Police Chief Janet Moon was asked about the deer situation but had not responded by press deadline Monday.